Editor's Note: From time to time, WestToast features guest posts from carefully screened writers who meet our extremely rigid standards of liking booze and being willing to write about it. Tom Loveday and Peggy Duncan, authors of this post, are part of this selective group. Being a host family has its privileges. This summer we hosted two Cal Poly baseball players while they played baseball for the Corvallis Knights of the West Coast League, a collegiate league with a family fun format similar to minor league professional baseball. The parents come to visit, usually for 5-7 days during a home stand and for one particular parent it happened to be the week Peggy and I celebrate our anniversary. We came home the day after our anniversary to a gift bag of wine. Now Peg and I do not tend toward the higher end wines and the ones she brought were nice, a merlot and a blend, a touch nicer than we usually get but not worthy of mention in this venue. NEWLY RELEASED! This latest vintage of the Mustang Red is our biggest award winner. It received the Chairman’s Award and Unanimous Gold from the Riverside and International Wine Competition, as well as gold medals from the Orange County Fair and the Long Beach Grand Cru. 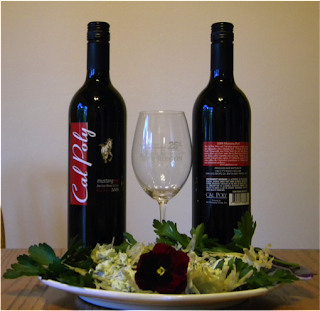 The Mustang Red is a blend of Zinfandel, Syrah and Tempranillo, with a little bit of Petite Syrah. This rich and full-flavored wine is ideal to drink with soft cheeses, grilled vegetables and red meat. 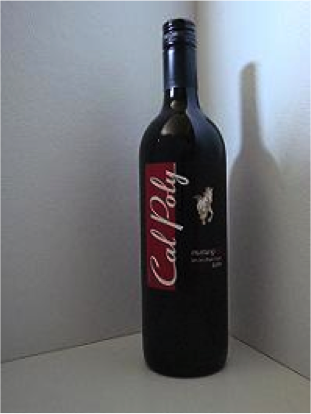 Since we are featuring the Wine as opposed to the meal all pairings will feature the Cal Poly mustang red wine. Of course we used our special fish plates to plate the meal as they make us feel special when we use them for dinner. Parmesan Fricos stuffed with goat cheese mousse. 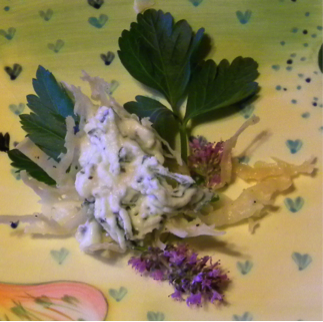 If you want my fine tunes for the recipes, comment on the blog and I’ll post them. 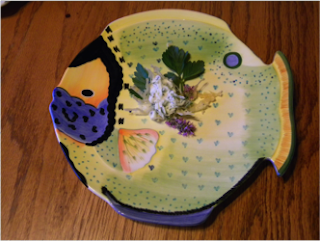 Note on the plating. You have to be lenient about the plating of the entree because by then we had consumed a bottle while cooking, and another to taste with the appetizer so the plating (on hindsight) is a bit sloppy. I found the mustang red to be very smooth starting with notes of cherry and plum with the Parmesan crisps a hint of tapioca came through and a light finish and a just a hint of vanilla in the nose. 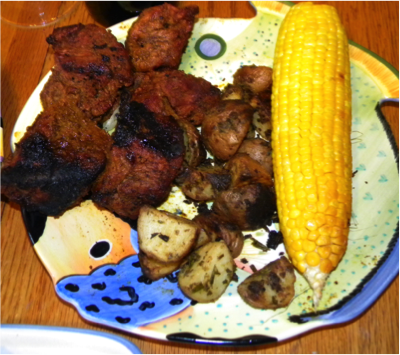 The Mustang red complimented the meat well helping to enrich the flavor. The cherry and plum start was still there but then notes of wood came out and the finish was fruitier than with the appetizer. All in all, the description of the wine on the cal poly web site was more accurate than I am used to. The wine works well with hearty food and meets the expectation of making a well paired dish better for having it with Cal Poly Mustang Red. My Affair with Mendocino and Winesong! Staple & Fancy: What the chef wants, you get.